What's the best way to travel Alaska? What’s the best way to travel Alaska? You’ll have the greatest flexibility to explore the sights and places the state is best known if you fly into Anchorage and use trains and automobiles to get around. If you want to see the parks, glaciers, and wildlife of Alaska, there’s no better way to get started. You’ll have a front-row spot everywhere you go, see incredible things overlooked by larger tours, and get a local’s perspective on what makes Alaska special. You don’t necessarily need a car on days downtown, but you’ll want some other transportation when you explore farther out. You’ll be able to explore the heart of the city without a vehicle if you choose. Downtown is a compact grid of pedestrian-friendly streets and avenues. Taxis, Uber and Lyft all offer easy ways to get from point to point in the city. Downtown is filled with accommodations, and many hotels beyond offer shuttles to and from downtown or the airport as well. 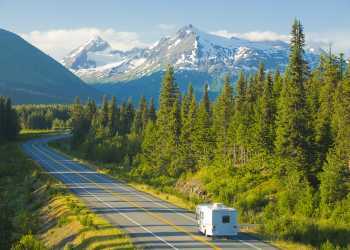 When you are ready to venture farther out – heading north as far as Denali or south to the Kenai Peninsula and Kenai Fjords National Park, you’ll want some wheels. Car rentals are easiest in Anchorage; all the major rental agencies have offices in Anchorage, often in multiple locations. Rent here, and you’ll have the best selection. The best road trips in Alaska start in Anchorage. If you’d rather let someone else take care of transportation, no problem. Anchorage is at the heart of rail and road travel for Alaska and there are more small aircraft and pilots in Anchorage than anywhere else in the state. The Alaska Railroad has its largest depot is in Anchorage, and trains depart the city daily all summer long for Denali, Kenai Fjords National Park and hidden gems like Spencer Glacier whistle stop. Independent travel doesn’t mean going it alone. Many tour companies start day trips and multi-day excursions in Anchorage. Go out for wildlife viewing, take a guided hike, spot glaciers, and leave all the driving to an expert guide. You can also use flightseeing companies to get to great places off the road system. The best wilderness bear viewing, remote day fishing, and even a visit to Denali are all possible on a flight out of Anchorage.